In my previous post I introduced TeamCity as an alternative build server to use in conjunction with Team Foundation Server. This post mainly focused on getting started with TeamCity and building sources coming from Team Foundation Server. At the end of this previous post I talked about the dependency of TFS artifacts with the TFS Build System. 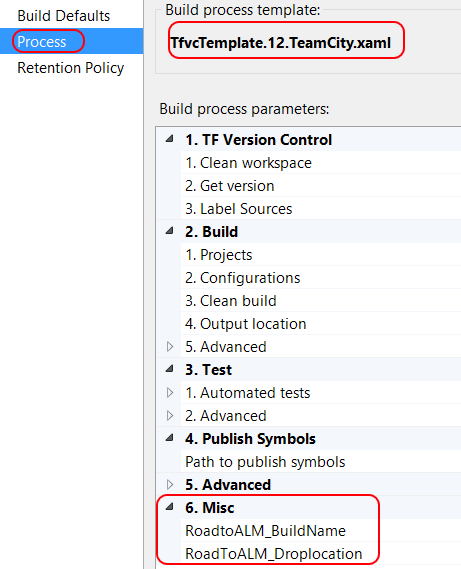 For example, selecting a build in Test Manager, can only be a build created with the TFS Build system. In this post I will talk about how to create a tight integration between TeamCity and TFS so that you can use the TeamCity build within Test Manager and in Work Items ….or at least fake that ..
As said, currently you need a build created in TFS in order to tie other artifacts to it. Of course you don’t need to tie everything together, but when you want traceability, reports or overview it is the wisest thing to do. So what we need is a build in Team Foundation Server. But….we use TeamCity. True, therefore we create a a very simple build in TFS as part of our Team Project that builds a blank solution. In the sources that you can download from github here you will find a blank solution called PlaceholderBuild.sln. Check this file into your source Control and create a build definition for it. I created an (old fashioned) XAML Build definition, that used the default template (later this will change), and pointed to this solution. I called the build definition [TeamCity_PlaceHolder]. Run the build and make sure it works ! TeamCity does not use a network share as its drop location as TFS does. But when we want to integrate things we need a drop location on a network share. Fortunately TeamCity has the ability to load plugins to add additional build steps. To publish artifacts to a network location you can use the Deployer plugin. The TeamCity manual about installing a plugin is a bit unclear. To understand the plugins in TeamCity you can better read this page. 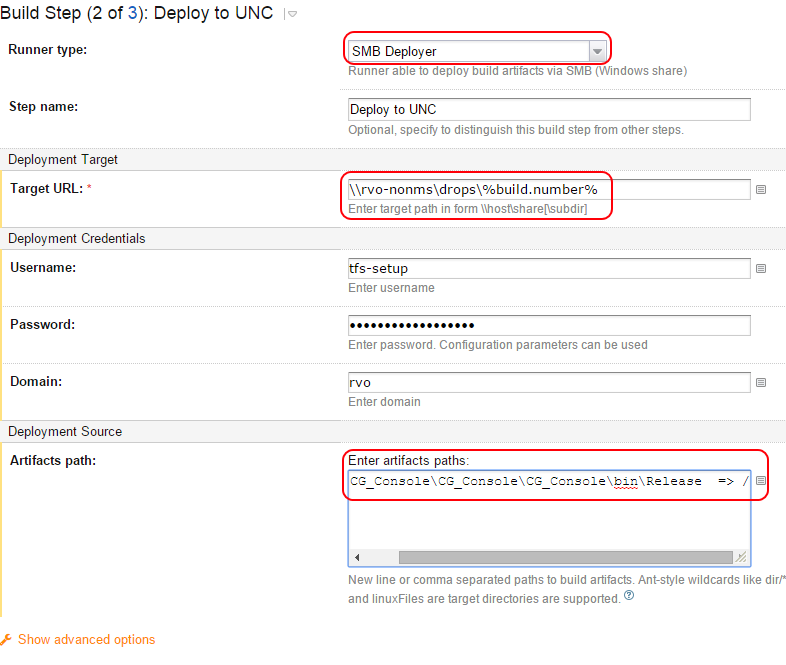 Or…if you just want to install the deployer plugin..follow these steps. Now we need to update our Build Configuration in Team Citty, so that it publishes to a network share. 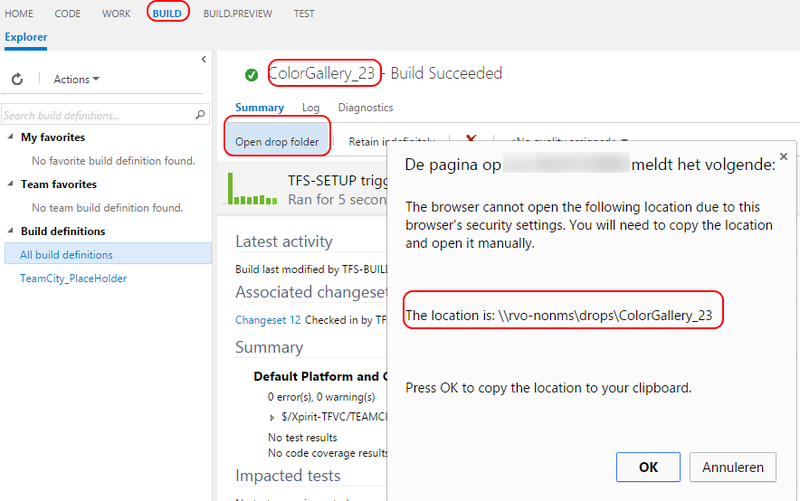 Open the build steps section in the Build Configuration and add a step. So now we have a TeamCity build and a TFS build. But how can we “link” those two builds together? First thing would be to align the name of the build. If you look in TeamCity or in TFS the builds are called the same. Second thing to do is aligning the drop location so that the build results in TFS open the artifacts location from Team City. In the previous step we have already made sure that TeamCity drops the binaries on a share. When you run the build that we defined in TFS (TeamCity_PlaceHolder) you will see that the name of the build is [TeamCity_PlaceHolder_YYYYMMDD.RRR]. This name cannot be traced to the TeamCity build, so we need to change that. The drop location is the one that we configured in the build definition so we need to change that too. In order to do that we need to modify the XAML build template and use the modified template instead of the default one. On MSDN there is guidance on how to do this (found here ). But I will do a shorter version. 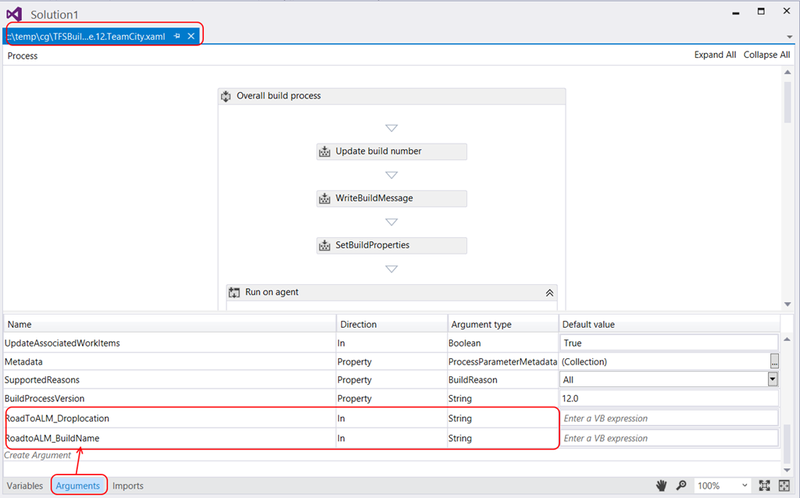 Edit the Build Definition and choose this new template as the Build Process Template to use. In my code I make connection to Team Foundation Server, find the Build Definition with the name specified and queue a new build with my 2 custom parameters. 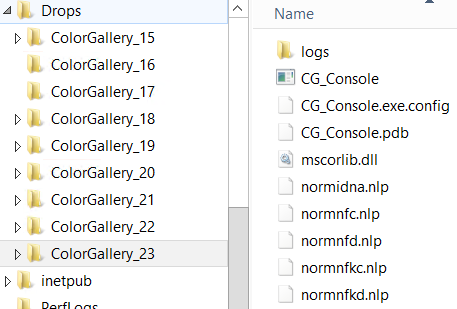 So now we have 2 builds and a console application that triggers a TFS build. Now it is time for the final step. Triggering the TFS build from Team City and adding the parameters. First you need to copy the console application executable to the TeamCity server. I copied it to a directory BuildScripts. Then we need to go back to the build steps of our build configuration and add a command line step. Notice the %build.number% placeholders that are filled in by TeamCity. Running the build now triggers a TFS build. The TFS build receives the new name and droplocation and sets this on the TFS build. In the picture above you see the name of the build in TeamCity set to the TFS Build as well. The drop location also points to the location of the TeamCity artifacts. Great thing is that TFS retention policies will just work on this drop directory because they are connected. Team Foundation Server is complete ALM solution but if you want to use another component this is perfectly valid. By using the TFS API and extension points we can easily integrate two great products to leverage the best of both world ! Nice article. What about using visual studio online TFS? Do you planning to do an example or guide for that? Would be nice! Hi, thanks for the comment. VSO is TFS online. So it is already integrated. What would you like to know ? An interesting solution to integrating TFS (on premises) with TeamCity for tightly Application Lifecycle Management (ALM). This solution probably does need some updating for TFS’s new build model. Also, it would be nice to have an automated provisioning mechanism. Having a solution like this in place would allow gating pull requests based on whether or not they have a successful TeamCity build.